Be the solo Alpine quintet with your accordion! The simpliest way is with the patented TOTTER MIDI QUINTET® function. 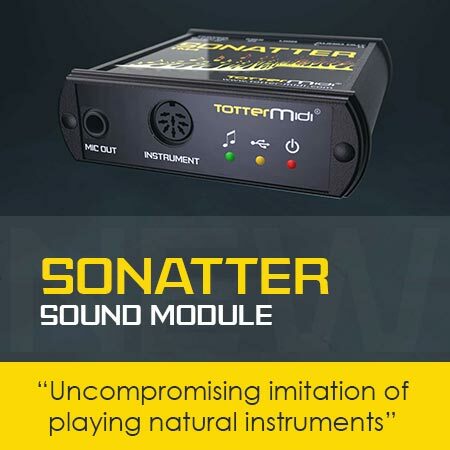 The patented TOTTER MIDI QUINTET® function enables the proper playing of brass and woodwind instruments – such us trumpet and clarinet in the imitation of an Alpine ensemble. The point of the function is that only one trumpet tone and only one clarinet tone are playing among all simultaneously played tones. The way of playing trumpet and clarinet has its own rules that differ from the way of playing accordion. The patented TOTTER MIDI QUINTET® function analyzes your accordion playing in real-time (live) and determines the tone of the trumpet and the tone of the clarinet. In other words, when you are playing your accordion, you will be able to hear trumpet and clarinet in proper harmony as well. Because melody is an important part of music, the patented TOTTER MIDI QUINTET® function is indispensable and you simply must have it. Only with this function will the songs sound originally, as if they were played by an actual Alpine quintet. The imitation is perfectly approaching the quintet playing. We developed the function for playing Alpine music. It is also excellent for other musical genres, such as classical music, jazz, pop, rock, etc. Even if you are an amateur, your playing will be heard professionally. The idea is simple and completely original. The patented TOTTER MIDI QUINTET® function complements our patented TOTTER MIDI GUITARIST® function, developed to imitate the rhythm guitar in all musical ensembles.